A report from the Wall Street Journal says Google employees were discussing ways to change the company's search engine functions in order to counter the Trump administration's travel ban. The travel ban initially went into effect last year but was contested at every turn by Trump's opposition including several judges from states like New York and California. The tweaks employees proposed would have shown users how to contribute to pro-immigration organizations. According to internal company emails obtained by the Wall Street Journal, the changes would also aid users in contacting lawmakers and government agencies to voice opposition to the travel ban. The report goes on to say the emails revealed "woke" discussions about ways to "leverage" search functionality to combat what they far-left SJW's at Google called "Islamophobia." Meanwhile, Google's CEO, founders, and other high-level staff all retain personal security in private gated communities. Walls are OK for them, but the rest of the country's peasants don't need them, and if they want to protect the borders then they call them bigots, racists, and Islamophobes. They came up with a plant to alter search terms 'Islam,' 'Muslim,' 'Iran,' etc." and "prejudiced, algorithmically biased search results from search terms 'Mexico,' 'Hispanic,' 'Latino,' etc." Thankfully, the disclosure of the emails will add pressure and intensify the already mounting scrutiny of the company by conservatives who have recently called out Google for being politically biased and censoring. Google recently coordinated with other big tech companies to effectively deplatform right-wing radio host Alex Jones by banning him from Google, and any Google-owned services such as YouTube. Google recently came under fire for being a no-show at a high-profile Senate hearing on Capitol Hill. While Google representatives did not attend, Twitter CEO Jack Dorsey and Facebook COO Sheryl Sandberg both appeared as requested where they were grilled by members of Congress over election integrity, security and the left-wing bias of the company's algorithms and employees. Lawmakers scorned Google for the decision not to send the company's CEO Sundar Pichai or Alphabet CEO Larry Page. Google issued a statement Thursday denying that any ideas to interfere with the travel ban were ever implemented. They did not deny that the topics were discussed. The Google Statement released Thursday said, "These emails were just a brainstorm of ideas, none of which were ever implemented. 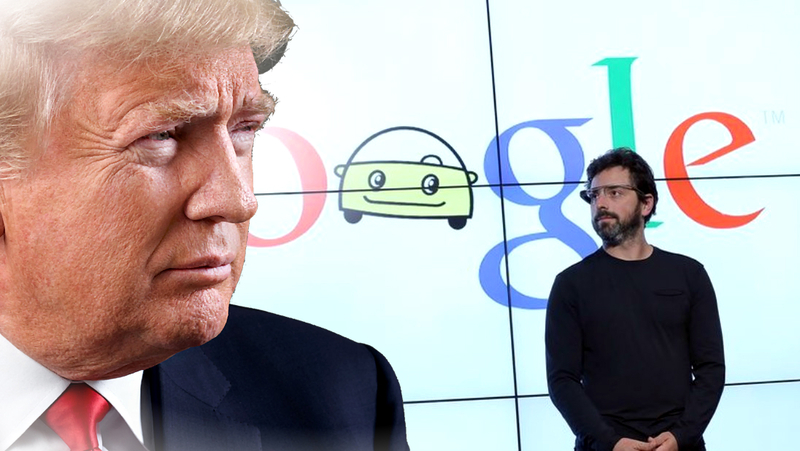 Google has never manipulated its search results or modified any of its products to promote a particular political ideology – not in the current campaign season, not during the 2016 election, and not in the aftermath of President Trump's executive order on immigration. Our processes and policies would not have allowed for any manipulation of search results to promote political ideologies." That short little statement may not be enough to satisfy President Trump who recently accused Google of being politically biased in a Tweet. The President tweeted that Google's search results are "RIGGED" and said the company is "suppressing voices of Conservatives." Trump isn't wrong about that; soon after Alex Jones was banned from all major platforms, they started going after smaller conservative channels and right-wing personalities. YouTube for example consistently hides conservative channel's videos from search results, demonetizes their videos, and gives community guideline strikes for ridiculous. The criticism of Google was renewed after a video was leaked last week showing Google co-founder Sergey Brin telling employees at a company meeting he felt offended by the 2016 election. The video was published by Breitbart and was shot at one of Google's weekly "TGIF" meetings just days after Trump won the election. Brin, who is also president of Google parent company Alphabet, can be heard saying in the video, "Let's face it, most people here are pretty upset and pretty sad because of the election. As an immigrant and a refugee, I find this election deeply offensive, and I'm sure many of you do too." The left-wing conglomerate of tech-megaliths that rule the sector even got together last year to sign a group letter to Trump opposing his decision to end DACA, the program instated by former president Obama that offered young felons living in America illegally a pass from deportation. The group letter was signed by Google's Pichai, Apple CEO Tim Cook, and Amazon CEO Jeff Bezos as well as over 300 others from the left-wing ruled tech industry. A spokeswoman for Google attempted damage control over the leaks saying that the remarks at the meeting have no impact on how Google runs its company and products.